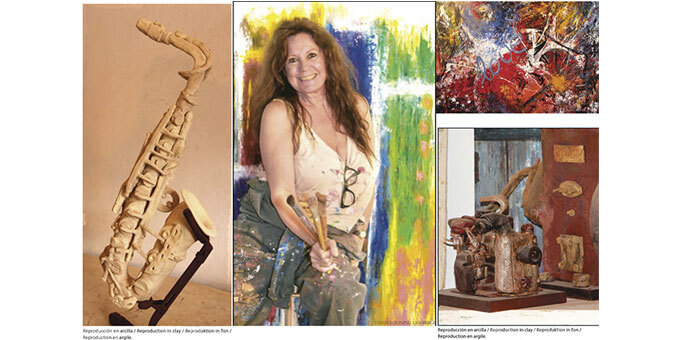 Artist, Kees ter Bruggen, has been a cherished island personality for over 28 years. As such, we were thrilled to catch up with her at her studio workshop; to learn a little more about her life and creative endeavours. Kees was born in Amsterdam in 1950. Daughter of both a dancer and saxophonist, she grew up in a household “bursting with song”. Her extended family added to the musical throng: making up a fundamentally all-singing, all-dancing troupe consisting of herself, her two sisters, 11 aunts and uncles, and 54 cousins. Their combined talent culminated each year in a stage spectacular that would surely rival those of the Von Trapps! Classical guitar was Kees’s chosen instrument from a very early age. At 12, acting school beckoned. At 14, she decided to boldly cut financial ties with her parents and fend for herself – subsidising dancing and singing classes by doing lead guitar and vocals in cabaret theatre and routine bar work at night. Testament to her dedication and hard work, she was already signed up with a dance group by the tender age of 16. From 18-21, she toured Europe with the renowned Dutch choreographer, Helen le Clercq’s, dance group – not least entertaining the numerous US troops stationed in Germany. From 21-36 she embroiled herself in musical theatre touring Holland. All her performing years ultimately built up a princely résumé flaunting her as a well-known stalwart of stage, television and big screen; as both actress and dancer. In amongst this, she also gave birth to her first son, Juangui, and met her soul mate, musician Eric-Jan Harmsen. At 36, Kees gave birth to her second son, K.C. When he was just 4 weeks old, Eric-Jan and Kees moved to Ibiza. “We arrived without money and worked our arses off! I never regretted coming here though, it was worth it. And I was so busy, I never had the time to miss show biz.” The hard work of which she speaks, was of course courtesy of Teatro Pereyra in Ibiza town; a much acclaimed live music bar started up by herself and Eric-Jan 25 years ago. To add to the typically frenetic pace of their lives, Kees’s third child, Tess, arrived just four weeks before its grand opening! Clay work and painting on canvas are her great passions. Extensive experimentation and training in both had earned her 1st prize in the Ibizencan competition, Juan Daifa, in 2005. This win financed her to buy a kiln and set up her workshop/studio where she still works today. 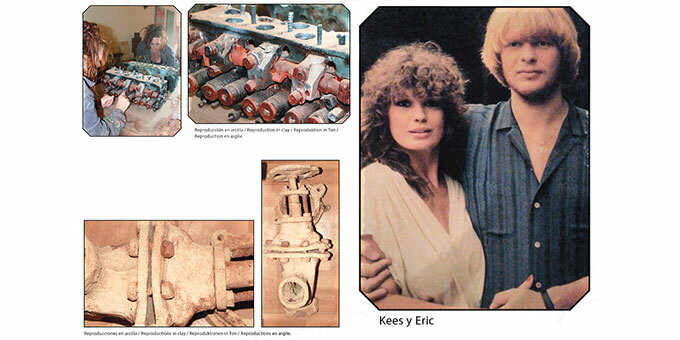 When she wasn’t busy hosting people from far and wide pleading use of her kiln, Kees was exhibiting widely in Amsterdam, and locally at the Centro Cultural de Ibiza, Consell Insular in Ibiza town, and Centro de Convenciones in Santa Eulalia. Not to mention the AMAE – a collective of 60 multinational artists based in Ibiza – with whom she still exhibits around the island six times a year. Her creative offerings fall into two categories. Firstly, her sculpture – predominantly replicating the human form and, most remarkably, recreating highly elaborate mechanical contraptions in clay. In fact, there’s nothing she loves more than finding rusty old mechanical devices, taking them apart, studying them meticulously, and painstakingly building clay replicas, piece by piece. Her next ambitious project is to take an old watch apart and reproduce its intricate internal mechanism in clay. 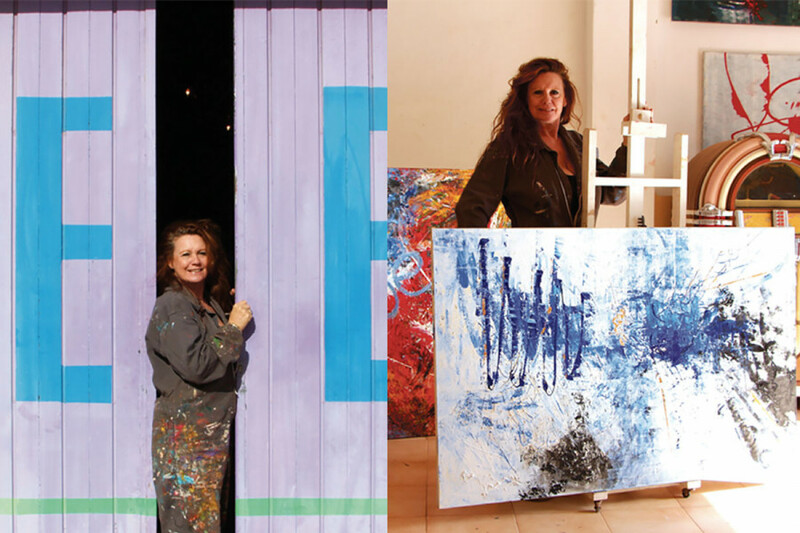 Her second great passion is doing vibrantly colourful oil/acrylic paintings on canvas, which take on a very pleasing abstract and contemporary form. However, the beauty of her paintings stems from far deeper than just her innate talent; every piece being the product of what’s been channelled to her in a meditative or dream state. “I don’t work from the head, I work from the heart. I transfer all my experiences, whether they be positive or negative, onto canvas. It’s a cathartic outpouring of my emotions. I have a vision of the painting in my mind’s eye before I’ve even put brush to canvas…” Indeed, a visit to Kees’s studio is like gaining very privileged access to her soul… a very special soul at that.